Anonymous Mint proudly presents an epic coin series, Anne Stokes Dragons. Currently, Anne Stokes is one of the top fantasy artists in the world creating eye-catching, striking designs. This Limited Edition series captures a selection of her awe-inspiring dragons in .999 Fine Silver, like this beautiful 1 oz Silver Round – Friend or Foe. Master Sculptor Luigi Badia is credited with creating sculpts that give the images a three-dimensional appearance. These exquisite, fantastical, limited edition rounds have been struck at Osborne Coinage, America’s oldest private mint. Premiering the Anne Stokes Dragons series is 1 oz Silver Round – Anne Stokes Dragons - Friend or Foe. Portrayed on front of this stunning silver round are an enormous dragon with large horns and spikes and a beautiful, fur-cloaked woman in a blue dress. The dragon has a fierce, dangerous appearance, yet the female stands confidently beside him as though if the two are friends. While the female embraces the dragon under his powerful jaw, she rests her head against his. The pair stare off into the distance with the night sky illuminated behind them. The standard reverse of the series features an iconic dragon design by Anne Stokes. The pure silver round portrays an overhead view of a grand, open-winged dragon. Encircled perfectly by its wingspan are the dragon’s turned, uplifted head and curved, spiked tail. Across the top rocker of the coin reads the text Anne Stokes Dragons while the bottom center text displays weight and purity. The fantasy art of Anne Stokes features life-like portrayals of art themes ranging from the romantic and mystical to the dark underworld of gothic subjects. Originally from London, England, Anne started her career as a merchandise designer for bands including the Rolling Stones and Queen. Her early illustrations were also featured in Dungeons and Dragons. Today Anne continues to produce and expand the ranges of her highly acclaimed artwork. The perfect birthday or Christmas gift for a fan of fantasy art, a Game of Thrones, Dungeons and Dragons! With a mintage of only 2000 rounds, don’t miss your chance to own part of the impressive 1 oz Silver Round – Anne Stokes Dragons collection today! Take a look at Kitco’s other Gift Ideas! This beautiful series of dragon coins features the art work of Anne Stokes, one of the top fantasy artists. Anonymous Mint worked with Anne stokes to bring her fantasy designs to beautiful 1 oz Silver Rounds. Anonymous Mint specializes in unique silver rounds with low mintage, and entrusts the production of these silver rounds to Osborne Mint. 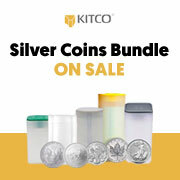 Why buy 1 oz Silver Round .999 - Anne stokes Dragons - Friend or Foe from Kitco?